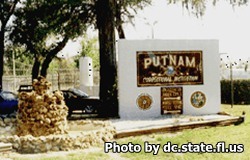 Putnam Correctional Institution is located in East Palatka Florida. It is a level IV facility that houses 458 minimum, and medium security inmates. Educational programs are offered to inmates so that they may earn their GED. Although there are no substance abuse programs offered, the chaplain's office offers Alcoholics and Narcotics anonymous meetings. This facility allows some inmates to work on crews for the public works department and other interagency services and contracted work. You may only attend visitation if you have filled out a visitors application and have been approved. Visiting is on Saturdays and Sundays from 9am-3pm. Registration for visiting begins at 8:15am and ends at 2pm. If you arrive after 2pm you will not be allowed to enter into visitation.